Herbs are the by-products of nature’s love and include leaves, fruit, stems, roots, and bark. Food is also considered an herb as are teas. You probably are using many herbs in your daily life and are reaping the rewards of their medicinal effects. This is a form of healing that is from a completely different angle. Every healing modality has its own purpose. Herbs are easily absorbed and used by the body. In Chinese medicine, herbs are always formulated in combination to merge their information for healing to achieve a multi-level impact. Herbs are natural ingredients, and the body can use them alone for support or in combination with treatment drugs. Drugs have a chemical effect that the body views as foreign. Slowly organs show signs of distress. This is an organ-function disorder. If it’s not addressed, will cause other organs to fall out of balance. Some signs of organ function disorders caused by common cancer treatments include hair loss, anemia, edema, loss of appetite, sluggish feelings, insomnia, less mental sharpness, nausea feeling cold, and night sweats. By using herbal formulas before treatment, the immune system has an opportunity to become stronger and surgery or treatment can be tolerated with fewer side-effects. Following the guidance of an herbalist during and after treatment will lessen the negative effects on the body, restoring balance more quickly. Some suggestions. Food is sunlight; it is water and earth in condensed form. The sun, the moon, the planets, and stars—all the elements of the universe come together to create food. So in the very highest sense, food is pure Universal medicine. Chinese medicine uses this energy connection for healing by prescribing food and herbs as medicine based on their true healing “ingredients”— that go far beyond physical properties like nutrients, calories, and vitamins. Each food has an energy essence that travels to and through specific meridians in the body. There are two categories of healing foods: those that are typically part of your everyday diet: vegetables like broccoli, celery, and carrots; fruits such as apples, apricots, and pears. 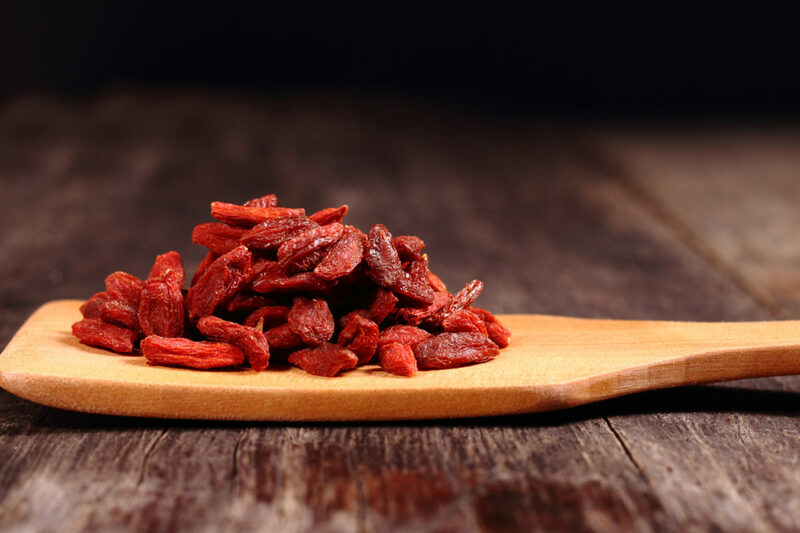 The other category includes foods and herbs that are not eaten on a regular basis: ginseng, goji berries, and coix seed (sometimes called “Chinese barley”). To use food for healing, first connect with your food cravings. Look back at the Five Element chart and see which taste is related to which organ. In this manner, you will be eating for healing. This is just the beginning. Food, and herbs are part of your natural healing tools. Here are some recommended foods.